Preheat oven to 90°C/200°F. Remove tendons from venison, then cut 1 piece per portion. Lightly salt each piece. Heat a frying pan over medium-high heat, add butter, and fry venison until all sides are browned. Remove from heat and transfer to the oven for approx. 20 min, until venison is cooked but pink in the middle. Cover with aluminum foil and set aside to rest. Lightly toast juniper berries in a dry pan. Gently grind juniper berries with a mortar and pestle. Transfer to a saucepan along with stock and cream. Simmer for approx. 15 – 20 min. Remove from heat and season with salt and pepper. Meanwhile, peel and mince shallots, garlic, and ginger. Finely chop parsley, grate carrots and cheese, and peel and cube potatoes. Deseed and cube pumpkin. Blanche potatoes and pumpkin for approx. 3 - 5 min. in a large pot of boiling water, drain and set aside, reserving some blanching water for later. Heat another saucepan over medium heat, then add some butter. Sauté shallots, garlic, ginger, and carrots until softened and fragrant. Add some cream and some of the blanching water to the saucepan, then bring to a boil. Add the pumpkin and potato cubes and simmer for approx. 5 – 7 min. Add parsley, cheese, nutmeg, and salt and pepper to taste. Stir in pumpkin seeds. Heat frying pan over medium heat, then add some butter, garlic, ginger, and rosemary. Warm and coat the venison in the butter, then add pepper to taste. Pass juniper cream through a sieve and discard the berries. Season to taste with nutmeg, salt, and sugar, then add cold butter and use a hand blender to purée until foamy. 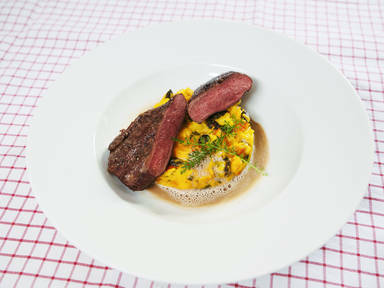 Serve slices of venison over the pumpkin ragu and drizzle with juniper cream. Enjoy!